Robert Powell is one special kid. This little boy with a smile of gold has stolen the hearts of many while staying at Ronald McDonald House of Dallas (RMHD). Robert was raised in an orphanage in China until the age of 8. He was adopted in 2015 by the Powell family. Anyone who has met the Powell family most certainly knows that the joy, warmth and love Robert displays comes in large part from his parents, Art and Jen. The Powells have ten children, four biological and six adopted: Jeremiah- 28, Allie- 18, Mercy- 17, Caleb- 16, Zachary- 16, Robert- 9, Jacob – 9, Zoey- 8 and Bethany- 6. They lost a baby many years ago. The Powell family has stayed at Ronald McDonald House of Dallas multiple times throughout the past year. Robert has endured six surgeries over a three-month period. 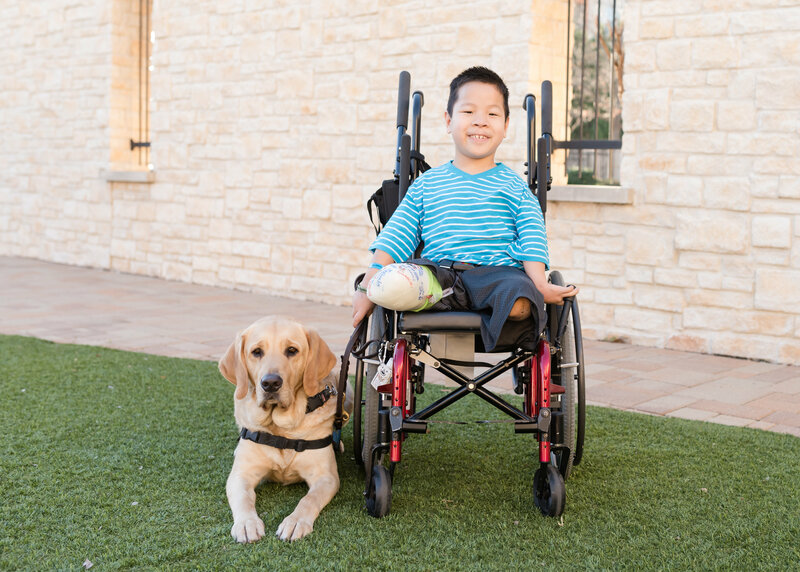 He was born with Arthrogryposis, meaning every joint in his body is affected by severe contractures; making matters worse, he had limited access to medical intervention in his first 8 years of life. Robert Powell has overcome tremendous challenges both emotionally and physically in his short life. He is a strong and determined young man. He has touched the lives of so many at the House. Having been nurtured by such a special family, this precious boy, along with his siblings, will certainly have a bright future ahead.